Aerial map showing location of new townhome neighborhood. Image courtesy of City of Mill Creek. On May 29, 2018, Mill Creek Hearing Examiner Phil Olbrechts approved the development of the new Creekside West townhouse neighborhood on 35th Avenue SE. Home-builder Village Life plans to subdivide 1.26 acres west of Nickle Creek on 35th Avenue SE into ten lots to accommodate the new single-family townhomes. Clearing and grading permits, building permits, and the site’s design approvals have yet to be issued by the city, so actual construction won’t begin for a while. Single-family attached townhomes are a permitted use on the property, which was up-zoned to medium density residential from low density residential by the Mill Creek City Council sometime between 2012 and 2014. According to City of Mill Creek Senior Planner Christi Amrine, the development will have no impact to the off-site wetland and Nickle Creek buffers. Access to the new neighborhood located at 13407 35th Avenue SE will be from a private road connecting to 35th Avenue SE. 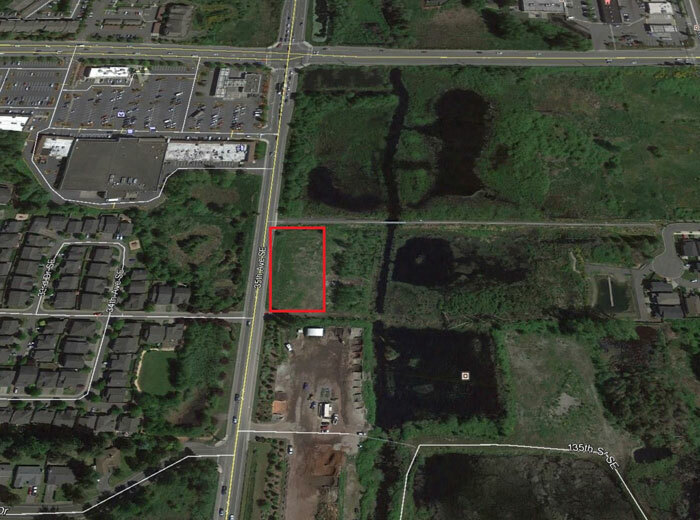 A fifty-foot-wide roadway buffer tract including a sidewalk and landscaping is proposed adjacent to 35th Avenue SE. The approved site plan includes the construction of ten single family attached 35-foot-high townhomes with parking for two cars in each garage. Associated infrastructure includes a school bus stop pad near 35th Avenue SE, six guest parking stalls, three rain garden stormwater facilities, and landscaping. Access to the lots from 35th Avenue SE will be from a 20-foot-wide private permeable pavement road on the northern property boundary. Another connection to 35th Avenue SE on the southern property boundary for emergency access only will be controlled with bollards to be installed with “Emergency Access Only”signage. The developer will pay mitigation fees to the City of Mill Creek including $15,000 for increased traffic, $3,650 for fire services, and about $46,000 for city parks. The Everett School District will receive $16,770 in mitigation fees from the developer as well. Creekside West preliminary platt. Image courtesy of City of Mill Creek.